You are waking up to something that most of us never, ever even dreamed we would be seeing. That the flags of the United States and North Korea are being displayed with one another in an official capacity would drop jaws alone. 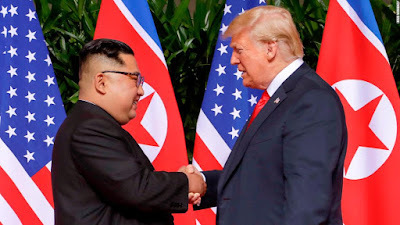 Two men who in the space of a few hours have accomplished more than their respective predecessors achieved in the previous seventy years combined. The end of the Korean War is at last at hand. Kim Jong Un has indicated he wants full stepdown of a nuclearized peninsula. Time will tell what the full measure of that intent yields, of course. But there really is a sense that the leader of North Korea is being genuine. Maybe Kim has done something even more impossible than what we are seeing on the world stage. Perhaps he is stepping out of the long shadow of his father and grandfather. There is no avoiding the obvious fact that by all accounts Kim has been a brutal dictator over his people. Even so, I have sometimes wondered if he was following the example set by his forefathers, without question. Has he turned from their example? 'Twould be a path that very few men in places of absolute power have ever taken. Could it be that we may have underestimated the character of Kim Jong Un? 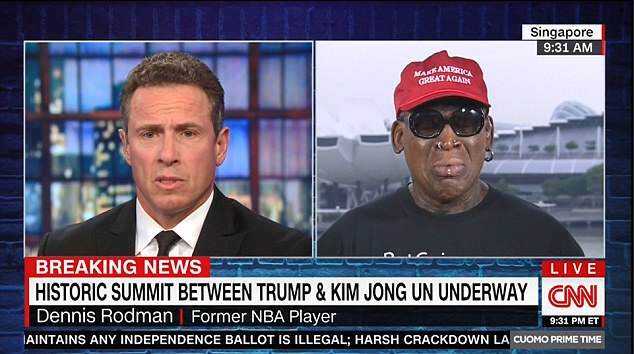 In what will surely go down as among the most surreal moments in the annals of global diplomacy, former NBA star Dennis Rodman broke down in tears during an interview on CNN and... seems like there really was a heart of gold behind his antics in Pyongyang these past few years. Rodman was serious about opening up a dialogue between North Korea's leadership and the United States, apparently. 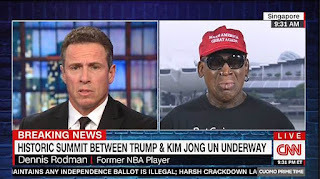 To hear Rodman tell it, his efforts were appreciated by Kim but when it came to presenting his labor to then-President Obama, he was rudely rebuffed. Only now, with Donald Trump in the White House, has progress been made and by all appearances magnificently so. Kim Jong Un is pledging to end his nuclear program, the Korean War is ending and Dennis Rodman is now more eligible for the Nobel Peace Prize than Obama ever was. It's as if we're in the Matrix and it's been reprogrammed by Electronic Arts. If you have small children, please be letting them watch this. And explain to them what's going on. One of the defining moments of my own life was the day that Reagan was shot. I wanted to turn the channel and watch cartoons but Dad told me "No we need to watch this, son. This is history. You'll be reading about this in books someday. This is something you can tell your own children about." Thank GOD that Hillary did not win! I don't want to imagine what the world would look like if she had. GWBush and Obama wrecked the world and in eighteen months Trump has repaired most of it and gone further than he promised. 2016, the election that keeps on giving. "If they gave the Peace Prize to Obama, Carter and Gore then Rodman deserves it even more!"